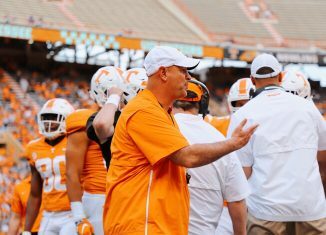 The Vols were back on the practice field Sunday afternoon after a week off where the focus was primarily on academics as the fall semester wrapped up with exams. 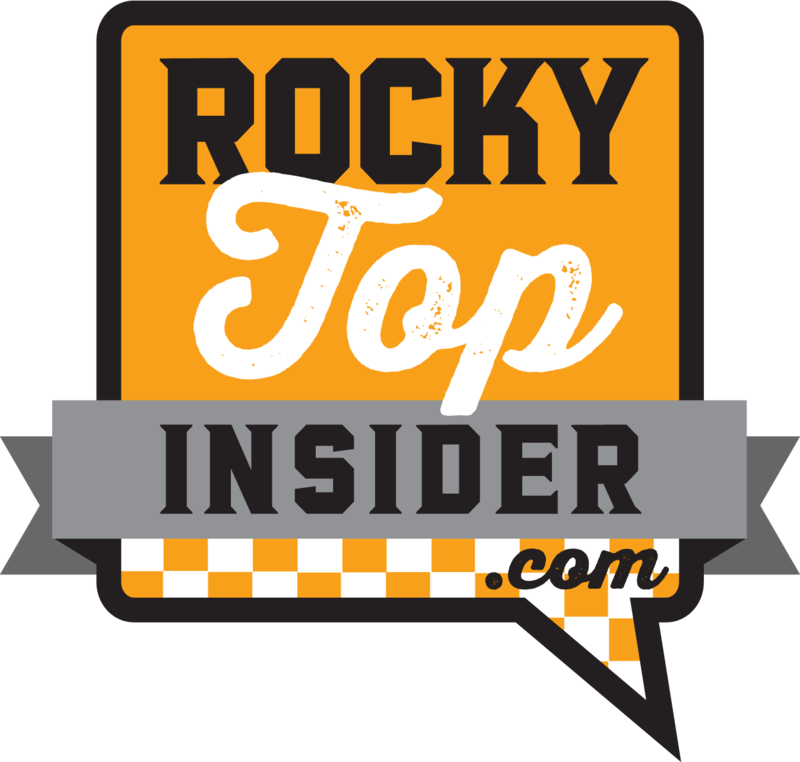 Speaking of the academic side, 11 current Vols graduated this past week: Brian Randolph, Justin Coleman, Mack Crowder, Matt Giampapa, Jacob Gilliam, Curt Maggitt, Marques Pair, Nathan Peterman, Trevarris Saulsberry, Jordan Williams and the suspended A.J. Johnson. Former Vols Dontavis Sapp and Jarvis Reado also graduated. Getting his degree in three years will give redshirt sophomore quarterback Nathan Peterman some options. 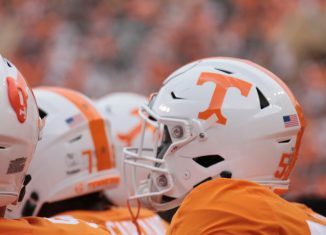 The Vols’ backup quarterback would be able to transfer to another FBS program without sitting out a year if he pursues a graduate-level degree that Tennessee doesn’t offer. We haven’t been told that he plans to do that necessarily, but it’ll be something to watch with Joshua Dobbs solidifying the starting job and talented newcomers Jauan Jennings and Quinten Dormady coming to Knoxville as well. Attrition was one of the themes of the weekend. Butch Jones has confirmed that freshmen DE Dewayne Hendrix, TE Daniel Helm and RB Derrell Scott are all leaving the program. Freshman DE Joe Henderson also appears to be on his way out of the program after posting a good-bye message to Vol Nation on Twitter Sunday morning. Those are four talented players with potential, so the losses can’t be called insignificant. But attrition is somewhat normal this time of year and with 32 talented newcomers this season, there were bound to be a few that sought other options. Each case is different, though two common links of the four players leaving are that they’re all from out of state and all had at least one other true freshman ahead of them on the depth chart for much of the year. “Every individual has a different reason, a different circumstance for that, but the only thing we can do is thank them and help them and provide help in finding another school and whatever they wish to do,” Jones said after practice on Sunday afternoon. Jones expects freshman defensive tackle Michael Sawyers, who hasn’t been practicing the past few weeks, to return for bowl practices, but he hasn’t been seen during an open practice yet. Reserve running back Justus Pickett might miss the TaxSlayer Bowl for academic reasons. Some rumors have swirled recently about Josh Malone and how happy he is in his role at UT. Based on what we saw on the practice field on Sunday, he appears to be as focused and content as possible as he prepares for what could be a big opportunity in this bowl game. Jones agreed with that assessment. Outside of the numerous players out for the season, the Vols are pretty healthy through three bowl practices. Running backs Devrin Young, Marlin Lane and Jalen Hurd continue to work in green, non-contact jerseys, though Young is the only one in any way questionable for the Iowa game. Curt Maggitt has been working on the side at practice as he takes some time to heal from some minor injuries late in the season, but he should be good to go in Jacksonville. The Vols will practice seven more times in Knoxville before leaving for Jacksonville on Dec. 28. The University of North Florida will be the Vols’ practice host as UT will get three work sessions in on that campus before facing the Hawkeyes on Jan. 3 at EverBank Field. The biggest news of the weekend came on Saturday when Nashville-native and 4-star cornerback Ugo Amadi announced that he had decommitted from Ole Miss and will now make his final decision between LSU and Tennessee in the coming weeks. This is big news for Tennessee, not only for the chance to add Amadi, but also with 4-star defensive end Kyle Phillips. 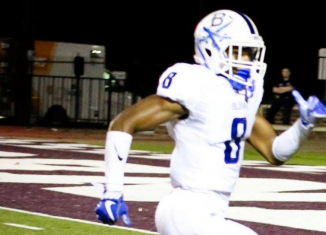 Phillips – who was in town over the weekend for his official visit – and Amadi have become very close during the recruiting process and reportedly plan on playing together in college. Phillips announced on Monday that he will be making his announcement on January 3rd at the U.S. Army All-American Game in San Antonio between Ole Miss, LSU and Tennessee. At this point, it looks like Amadi is likely to follow Phillips wherever he goes and the Vols are – seemingly – in very good position to land the Nashville duo. 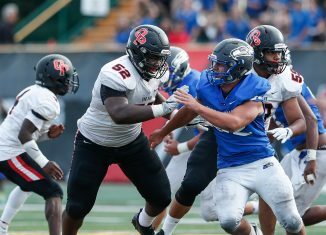 The Vols also got word on Monday morning that Maryville defensive end Dylan Jackson decided to decommit from the Vols and open up his recruitment. Tennessee – and most other schools – have Jackson projected as an offensive tackle at the next level, but he apparently has his heart set on staying at end. LSU is a school to keep an eye on for Jackson, but apparently it is Stanford that has promised him the opportunity to stay at defensive end should he join the Cardinal. Unless Tennessee changes their mind about leaving him at DE, or he opens up to the idea of playing on the offensive line, it is hard to see Jackson as part of the 2015 class. At this point, all eyes are on Indianapolis linebacker Darrin Kirkland Jr. as he is set to make his announcement on Monday evening. In talking to some people around the program and in national recruiting circles, the Vols should expect good news from Kirkland Jr. this afternoon. Tennessee is looking for a middle linebacker to add to the 2015 class after Cecil Cherry defected a few weeks ago and the 6’2, 235-pound ‘backer from Lawrence Central High School looks to be the likely replacement. Also along the linebacker front, things are still looking good for Alpharetta’s Quarte Sapp. 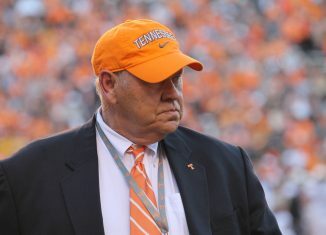 Sapp has long been considered a silent commitment to Tennessee, but has yet to make any type of public announcement. 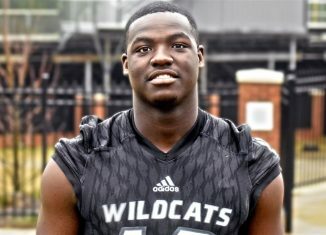 Things have been fairly quiet for Sapp recently, but Tennessee’s staff is still recruiting him extremely hard and he looks like a player who is set to join the 2015 class down the road. Sapp probably won’t be ready to see the field next season, but is a player with a very high ceiling and a lot of potential at his outside linebacker spot. With the news that Derrell Scott has decided to transfer, success at the running back position is now critical for the 2015 recruiting class. Tennesse already have Alvin Kamara and Rocky Reid committed, but with Reid continuing to leave his options open and listening to other schools, the Vols are doing their best to make sure their spots at running back are filled. Bryce Love and Kendall Bussey are now paramount recruits for the Vols in this cycle, and it wouldn’t surprise anyone if Tennessee tries to sign both of them. There are other names out there that Tennessee could try to get in on at running back in the near future, but their relationships with Bussey and Love leave them as the two most likely additions to this class as of now. 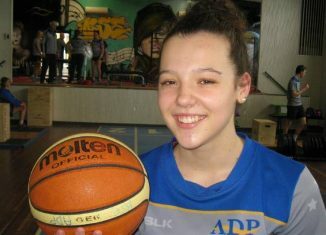 Things will be a little slower on the recruiting front over the next couple of weeks, as the winter ‘dead period’ began on Monday, December 15th and will last throughout the holidays. This means that the coaches are prohibited from contacting any recruit who has not been admitted to enroll early and cannot host any visitors on campus. The dead period ends on January 1st, so expect things to pick up drastically at the start of the new year. 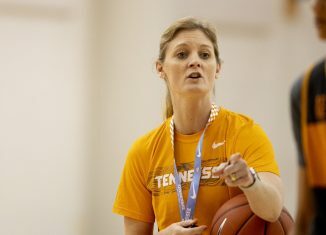 Lastly, some future Vols wrapped up their seasons over the weekend and put up some impressive performances along the way. Take a look at this week’s Commitment Stats post to see how Micah Abernathy, Darrell Miller, Quay Picou and Austin Smith performed. The Vols picked up an absolutely massive win over No. 15 Butler yesterday. Butler, the third top-15 team the Vols have faced this year, had only one loss headed into yesterday’s game – that loss came at the hands of No. 16 Oklahoma. Tennessee hadn’t downed a ranked team since Feb. 26, 2013 (No. 8 Florida, 64-58) – the Vols were 0-8 against ranked teams since that victory before knocking off Butler. Donnie Tyndall is now a remarkable 30-1 at home in the regular season during the last three seasons – 27-1 at Southern Miss and 3-0 at Tennessee. Tyndall’s last regular season loss at home came on February 9th, 2013, when Southern Miss loss to Memphis. 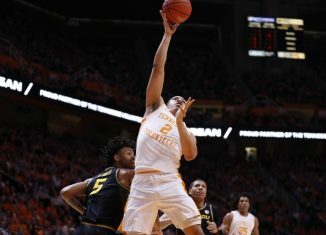 With wins over three possible tournament teams at home this season and Tyndall’s track record of success at home, it’s safe to say the Vols will be a tough out in Thompson-Boling Arena for nearly everyone on their schedule. Next up, the Vols travel to Raleigh (Wednesday, 7pm, ESPN2) for their first true road game of the season. NC State is 8-2 and coming off a 55-54 home loss to Wofford. That loss isn’t is bad as it may seem. 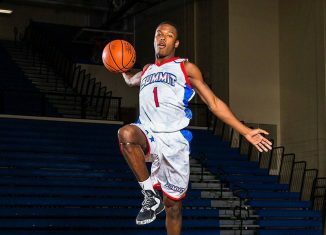 Wofford (ranked 74th by KenPom.com) should win the Southern Conference this season and senior guard Karl Cochran was named the SoCon Preseason Player of the Year. 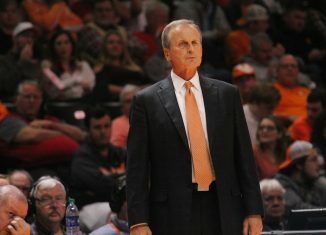 NC State is ranked 48th by KenPom.com while the Vols are up to 88th in his rankings. After Wednesday’s game with the Wolfpack, UT returns home to face Tennessee Tech (Friday, 7 pm, Fox Sports Net). 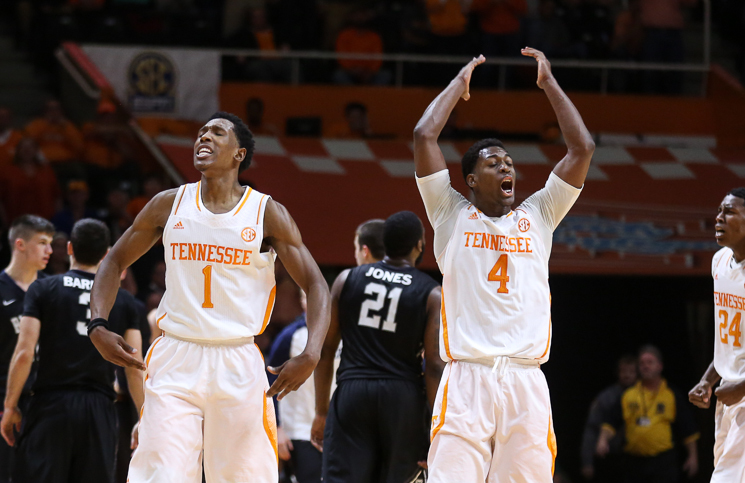 The Vols will close the year with four winnable games at home before entering SEC play in January. With a win over NC State, a 9-3 record headed into 2015 will be in reach. 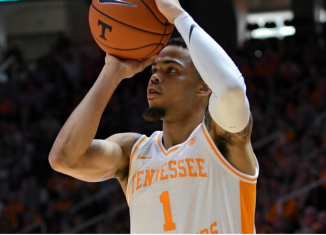 If KenPom.com’s projections hold true, the Vols will be 8-4 headed into their first SEC game (at Mississippi State at 9 pm on January 7th, TV: SEC Network). On the recruiting front, Tennessee hosted a 5-star center this weekend. You can read about him here.